The report defines automotive electronics as the use of electronic systems in the automotive vehicles such as passenger car, heavy commercial vehicles, light commercial vehicles, and other vehicles in applications such as powertrain, body electronics, engine management, navigation systems, lighting and safety among others. The global automotive industry has grown significantly over the past couple of decades. Moreover, the automotive industry has evolved with the advancement in technologies and innovations worldwide. This industry is driven by growing demand for luxury cars on the backdrop of increasing per capita income and availability of financing modes for the purchase of vehicles. With the rise in production of automobiles, the market size of automotive electronics has increased significantly. The automotive electronics account for nearly 30% cost of the vehicles. As a result, growth in automotive manufacturing is likely to drive the growth in the automotive electronics market. According to report the automotive electronics market was sized over USD 685.41 billion in 2017. The global automotive electronics market is projected to grow with a CAGR of 6.9 % over the forecast period of 2017-2023 and reach USD 1088.29 billion by 2023. 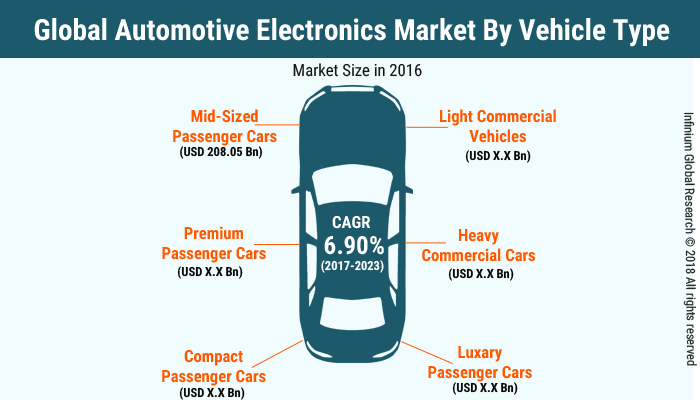 The global market for automotive electronics is driven by the factors such as growing demand for automobiles and premium cars in the emerging markets, innovations and technological advancements in the global automobile industry and increased manufacturing capacities of the automobile manufacturers. On another side, short life cycles of the electronic technologies and the growing prevalence of counterfeit and low-cost electronic systems are likely to be the primary restraining factors affecting the growth in this market over the forecast period. The report on global automotive electronics market covers segments such as vehicle type, sales channel, and application. The vehicle type segments include mid-sized passenger cars, light commercial vehicles, premium passenger cars, heavy commercial vehicles, compact passenger cars, and luxury passenger cars. On the basis of sales channel, the global automotive electronics market is categorized into aftermarket and OEM. Furthermore, on the basis of application, the automotive electronics market is segmented as entertainment, safety systems, body electronics, power train and advanced driver assistance systems. Among the regions, the Asia-pacific region accounted for the largest market size in the year 2015, owing to the significant presence of manufacturing units of leading automotive brands in countries such as India, China, and Japan among others. The growing demand for emerging markets of Asia-Pacific such as India, China, Malaysia, Indonesia, Thailand, and among others is anticipated to escalate the CAGR in the region. The Asia-pacific automotive electronics market is projected to grow at a CAGR of X.X% over the period of 2017 to 2023. The report provides profiles of the companies in the global automotive electronics market such as Delphi Automotive, Audiovox Corp., Avago Technologies, Altera, Continental AG, Denso Corp., Atmel Corporation, Bosch Group, Dow Corning, and Infineon Technologies AG. The report provides deep insights into demand forecasts, market trends, and micro and macro indicators. In addition, this report provides insights into the factors that are driving and restraining the global automotive electronics market. Moreover, IGR-Growth Matrix analysis given in the report brings an insight into the investment areas that existing or new market players can consider. The report provides insights into the market using analytical tools such as Porter’s five forces analysis and DRO analysis of automotive electronics market. Moreover, the study highlights current market trends and provides forecast from 2017 to 2023. We also have highlighted future trends in the automotive electronics market that will impact the demand during the forecast period. Moreover, the competitive analysis given in each regional market brings an insight into the market share of the leading players. Additionally, the analysis highlights rise and fall in the market shares of the key players in the market. This report will help manufacturers, suppliers, and distributors of the automotive electronics market to understand the present and future trends in this market and formulate their strategies accordingly.